After this week, your baby will look less wrinkly as baby is now forming the subcutaneous tissue. In order to protect their newly-acquired smooth skin against continual exposure to the amniotic fluid, baby will produce a substance that will cover the skin. It is much like a kind of cream. It is white and called ‘vernix caseosa’, or simply vernix. It can adhere well to the skin because of all the fine hairs covering your baby’s body but baby does lose some of the downy hairs when the vernix is produced. 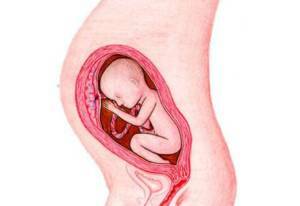 When your baby is born, you sometimes see some of the white substance on their skin, often in the folds. The later your baby is born, the less of the cream you will see. You baby has already grown to 15.2 inches and weighs 2.54 pounds! Baby may get the hiccups sometimes, you may feel a jerky movement in your belly or see your belly rise up a little and then go down again. Ask at a hospital near you when you can visit and see the delivery room. Do this even if you want to have a home birth. You never know what might happen and then it is nice to know where you will be going and what it looks like. There are still only seven days in a week but each week seems to take longer. You are probably thinking about only one thing: maternity leave! You want to get the last things ready before your baby arrives. Your body needs more and more rest and so do you. The ‘nesting’ process has started. You withdraw more often and live more in your own world. That is completely normal, because this process is also part of your body preparing for the delivery and birth of your baby.